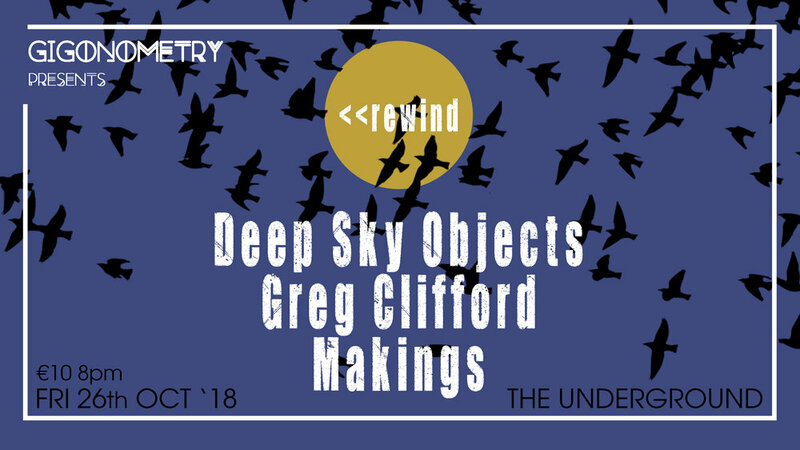 The bi-monthly 'Rewind' series of gigs, for acts that have previously played Gigonometry, concludes for 2018 with the amazing Cork/Kerry trio Deep Sky Objects, Dublin's own Greg Clifford, and Donegal/Dublin combo Makings. Deep Sky Objects are a three-piece alternative-rock band. The band members consist of the O’Brien brothers Kevin (lead vocals, guitar), Thomas (drums and backing vocals), and DD Foley (bass guitar and backing vocals). Deep Sky Objects stemmed from a shared mutual interest in groups such as The Smiths, Interpol and Radiohead. In late 2015 the band began to record a collection of demos, released under 'We're Done Falling', which went on to physical release in June 2015. Since then Deep Sky Objects have recorded their debut self-titled EP 'Deep Sky Objects' in Whitewell Studios with Ciaran O'Shea, and mastered by Fergal Davis. 'Deep Sky Objects' received great feedback from fans and reviewers, being played on stations such as Today FM, Spin SW and Cork's 96 FM. The band continue to tour Ireland and the UK throughout 2018 promoting their new music. "Unleashing an impassioned and dramatic chorus that pulls the listener in by the throat"
See recent single/video Bones above. Greg Clifford is a Dublin based independent musician. His style is an authentic synthesis of Indie-pop rock fused with electronic aspects and 'classical' guitar fingerpicking. 2017 saw Clifford release a new LP entitled 'Quodlibet', as well as play 17 gigs across Ireland as for the songster with the release of 'It's Too Late', as well as gigs in England and Poland. Aside from his solo endeavors, Clifford works as a session musician, producer, arranger and filmmaker. He has also toured internationally with a classical guitar ensemble, scored for & performed with the RTE Concert Orchestra in a sold out National Concert Hall and holds a Masters in contemporary composition. Makings are a six-piece electro-rock act inspired by bands such as LCD Soundsystem and Depeche Mode. They mangle modern electro with traditional instruments, creating a contemporary sound that you are dared not to dance to. Since the release of their debut album in 2015, they have toured internationally and have made appearances at Vantastival (IRL) , Swell Festival (IRL), YouBloom Festival (IRL) , Blogtober (UK), Lechlade Music Festival (UK), The Monarch (UK) , Proud Camden (UK), The Balor Theatre (IRL) and many other venues around UK and Ireland. This summer they also released three singles 'Blackhole', 'Pulse' and 'Beck N Call' from their forthcoming second album. Blackhole and Beck N Call features newest recruit Cairon420 on rap duties. Expect to see many more releases throughout 2018 from this ever-evolving live act. Makings - Our Annual Update and End of Year Gig Announcement..